Building your own home gives you the incredible opportunity to customize the space exactly to your specifications from day one. While you understandably want the house to look amazing, it is also essential for it to be fully functional for all of your needs and desires. You can add real value to your home and improve your quality of life when you think about Installing useful technology during the construction process. Regardless of whether you have a dedicated media room, a man cave or a basic family room, you want the sound system in these gathering places to be amazing. You can install wiring for a quality sound system when the rest of the installation is finished. The smart idea is to incorporate sound system wiring throughout the entire home and even in the garage and on the patio. This can improve your quality of life dramatically and can make your home more valuable when you decide to sell it in the future. Smart home technology is more than a fad, it is changing lives by adding convenience and function to homes. Some smart home features are decorative or plug-in, in nature. However, others are more permanent. For example, you can connect smart home technology to your automatic blinds, your HVAC system, your light fixtures, your doorbell and more. Your home automation system should include garage door monitoring as well for more comprehensive benefits. Another idea is to connect your home's built-in sound system to the smart home controls. Through automation, you will benefit from convenient and immediate control over all aspects of home security. Choosing thoughtful features to add to your home during the construction phase requires careful research and planning. It is much easier to add these thoughtful features to your home before the construction is complete, and these features can add value to your property and convenience to your life in numerous ways. Examine the various features available for these technologies before you finalize your plans. If you are doing a large home project, make sure that the flooring is the last thing that you do. Install the floor after all the windows, doors, trimming, and painting have been finished. This will keep you from damaging your new flooring, and will allow you to match the materials to the rest of the room. After all other things are done, the heat and humidity are constant, so the material of the floor will not change its size due to temperature changes. Make sure that there is nothing on the floor or ceiling until you finish with the project. No matter what material you are using or how much of the room you are working on, the whole space should be empty. This will allow you to clean the sublevel and work on your project without having to constantly work around other furniture or decorations. It also means you won’t have to worry about accidentally damaging anything. If you are installing wooden floors, you have to have an underlayment to avoid future squeaking. Underlayment can also help your floors stay warmer and reduce the moisture that builds up underneath your flooring. The success of flooring is in the details, so don’t forget use an underlay. While your underlay can smooth out little imperfections in leveling, bigger problems need to be addressed or your flooring isn’t going to lay properly. It’s important to thoroughly clean the floor so it doesn’t undo your efforts. It is possible to level the floor yourself using a self-levelling compound. Just make sure you double check the leveling after it has dried to make sure it worked properly. Flooring materials are expensive, and you don’t want to waste any of them if you can help it. The saying measure twice, cut once is in full force here. Measure the area you are covering multiple times and plan out the placement of your flooring before you cut the first piece. This will keep you from wasting materials or making a costly mistake. Adding new flooring is an exciting venture for your home and it can be a lot of fun. Just don’t forget to follow these tips to get the best possible results. Today, pools and hot tubs are no longer an exclusive asset for the wealthy. Though installation and construction may take time, there are qualified sellers and installers in every major city who will work within your budget to get you the pool or hot tub of your dreams. There are dozens of different kinds of features to choose from, and even more variation in design. With so many options and choices, you need to take your time to decide what’s right for your lifestyle and your home. Learn the steps needed to select a pool or hot tub for your home. To make the best use of your pool or hot tub, first imagine yourself using it. Is it inside or outside? Do you want to swim laps along the length? Do you want to play and swim with your kids? Do you want to have a nice hot soak in the hot tub after a long day? Once you know what you want to do with your pool or hot tub, then you can decide on what kind of features you want that compliment that vision. Once you have your vision, you can start researching the different kind of features available. Learn about the standard features, such as jets, a heat pump, and a dive board. Then, look up unique optional features like bubblers, night lights, or even a sound system to place underwater. Think about the kind of filtration systems you would like to use, whether you want salt water or chlorinated water, and the method of maintenance you prefer. Before completely setting your heart on anything, be certain to research the companies that could make, design and install your pool or hot tub. Most companies provide plenty of customer reviews and testimonials on their websites, and they will boast about their reputation if they have many positive reviews. While you should definitely stay away from companies that receive bad reviews, you should also be aware of companies that seem too good to be true; most companies are bound to have a few complaints, and if there are none, approach the company with healthy skepticism. Read reviews about each company’s products. In general, pools and hot tubs are difficult to review by consumer protection sites, such as the Better Business Bureau. For hot tubs in particular, Bullfrog Spas explains that “one of the reasons online hot tub ratings and reviews are confusing is that hot tubs, to date, have not been covered by some of the more historically trustworthy consumer review sources like Consumer Reports.” Because of this, you need to be especially cautious. Find out about your company’s professional credentials, such as licenses, and their years of experience. Look at their portfolios of past work. Check their ratings on at least two consumer protection sites, such as the Better Business Bureau. Nowadays, if you want a pool or hot tub added to your home, you’re in luck. They are readily available, highly customizable, and valuable to your home. There are a variety of features to make your pool attractive, efficient, and multifunctional. Consider all of the options available to assist you with choosing the right pool or hot tub, and once it’s installed, make sure you have a plan to keep it clean and maintained. Safety. Peace. A sense of protection. These are all examples of how adding a security system to your home can help your overall health. We all want to feel safe and secure in our homes. We want to be able to sleep peacefully at night knowing we are protected. We also want to have the peace of mind that comes from knowing our families are protected. There are numerous ways to accomplish this task, and in this article, we go over just a few. Augment your home automation setup with security and monitoring. You can monitor your home while you are away. You can set the temperatures in your home. You can unlock doors with the touch of a button or set your alarm if necessary. As a parent, there are times when you need a night out. An automated security system allows you to check on your home to see who might be in it and how your children and babysitter are doing right from your mobile device. By monitoring your security cameras every so often, you can rest assured that your children are safe and your home protected. This peace of mind allows you to relax and enjoy your evening away. This is also a great asset when you are away from your home for any length of time. Having your security system set up to notify you and record when movement happens can help in case of a burglary and can also ensure that whomever you have checking on your home is doing so on a regular basis. Lighting in the home can impact a person’s well-being on several levels. Homeowners with smart lighting integrated into the home security system have the option to regulate lighting in the home while away for an added sense of security. The right lighting can also have a positive physiological effect since the human body requires lighting for a certain amount of time on a daily basis. According to the Journal of Clinical Endocrinology and Metabolism, exposure to varied levels of lighting can affect a person’s risk of getting type 2 diabetes, cancer or high blood pressure. In having security monitoring in the home, people will find that they will enjoy greater peace of mind. You are far less likely to be stressed with a security system especially from a reputable service provider. You can sleep better at night with a home monitoring system protecting your residence whether you are home or away. A home monitoring system with carbon monoxide monitoring prevents your home from being vulnerable to accidental poisoning due to a gas leak. From 2010 and 2015, 2,200 deaths were reported as a result of unintentional carbon monoxide poisoning. Some of the systems alert the authorities automatically if there is some carbon monoxide issue. Additionally, having a system that can monitor humidity levels can reduce your vulnerability to home damage due to mold while you are away. Better sleep is another benefit of having a security system for your home. You can control your light settings using automation. This automation helps you regulate your sleeping schedule so that you can sleep peacefully. You can upgrade your system to alternate between different light settings. As the evening winds down, you can program the light settings to adjust accordingly. You can achieve a much more restful night with such a system, and improve both your mental health, memory, and concentration capabilities. You can reduce your chances of getting the cold or the flu by better controlling the temperatures in your home. Some security monitoring systems allow you to program the temperature settings. The system can alert you to fluctuations in temperature, warning you if they fall above or below a certain level. A 2007 study led by New York’s Mount Sinai Medical School found that that optimal temperatures improve your respiratory system’s ability to eliminate toxins. Lower temperatures cause the respiratory to work harder and lose its ability to remove contaminants from the system correctly. This is why some people have a harder time recovering from colds and respiratory illnesses. In taking advantage of the programmable settings, your mental health and overall well-being can be positively impacted. You can automate settings within your security monitoring system and derive multiple benefits in doing so. The first call you should make should be to your insurance company, they will be able to guide you through your personal options based on coverage and circustance. Fortunately, there are restoration companies that cater to salvaging belongings after a hurricane. Whether you acquire this service through your insurance ocmpany or hire them directly, these companies can help walk you through the process, but it is best that you understand some basic instructions for yourself to make the process much smoother. Firstly, you should find out what kind of water touched your belongings. The kind of water that touched your belongings will determine if they are worth salvaging. There are instances where your items may have been submerged in contaminated water, which will mean that you should not salvage those items. Although these types of items may appear to be salvageable, they may have become home to a variety of harmful organisms and toxins. If you have any doubt, it is highly recomened your err on the side of caution and/or consult a professional. Next, you should examine your belongings for damage and discoloration. Items that are badly damaged may not be worth salvaging and may even sustain more damage during the restoration process. For example, a torn pillow may completely shred during chemical treatment. Chances are, you may not be able to clean your belongings right away. After losing your home, you may be staying with a relative or in rented housing, but it’s unlikely that you’ll want a pile of wet, dirty things (even if they’re yours) in your living space. Storing them temporarily in a storage unit can help keep them safe until you’re ready to start cleaning, and then until you have a place of your own again. Depending on how much you have been able to salvage, you are likely to need a unit between 100 and 200 sq ft, an investment about about $100-$200/month (Aurora Self Storage). You should make every attempt to dry out your belongings before moving them to a storage unit. Keep in mind that it is crucial to be delicate with wet items, as they can disintegrate very easily. Hang, or lay out, all of the items that need to be dried; it will be best to dry them using air rather than heat or other traumatic methods. If you are not able to dry out your belogins prior to storage be sure to use a climate controlled unit so that you can avoid adding a moldy situation. Once dry, it’s time to start cleaning. You will need a small toothbrush, mildly hot water, laundry detergent, and a damp cloth; again, be delicate when cleaning your items. You may also wish to use a disinfectant such as bleach solution. Finally, leave your items to dry again. If there are items that you personally cannot, or couldn't, clean, contact a restoration company to take care of the job for you. These companies specialize in fixing badly damaged items, and they have the proper tools for the job. It is best to take a calm approach to restoring your items. After going through such a devastating experience, it is easy to want to rush everything to get back on your feet and return to normal. But a little bit of patience and care will take you a long way on your road back to recovery. Chain link fences are perfect for keeping pets and children safe and for keeping unwanted intruders from trampling the landscaping. They are the cheapest to install and require almost no maintenance. You won't be hiding your plush lawn and rose bushes, but a chain link fence won't provide any privacy either. Popular for centuries, wooden fencing is still the choice of many homeowners. You will get the advantages of a chain link fence while adding cottage-style charm to your home. Wood is good for building tall privacy fences, and neighbors sometimes share the cost of installing them. Depending on the type of wood you select, a wooden fence should last without significant overhauling for around 20 years. A wooden fence will need ongoing staining or painting, and damaged pieces will need replacing. Vinyl or "plastic lumber" fences became in vogue during the 1980s. A white vinyl fence can add all the beauty of a wooden fence with less upkeep. They are available in many models from picket fences to privacy fences. Instead of coats of fresh paint, you can simply wash them with soap and a hose for a continuous brand new look. Aluminum fences are fairly maintenance free and are not as pricey as wrought iron or steel. You can paint them to look like virtually any other kind of fence. If you live in an area that gets lots of extreme weather, aluminum fencing is not a good choice, as it is damaged more easily than other types. 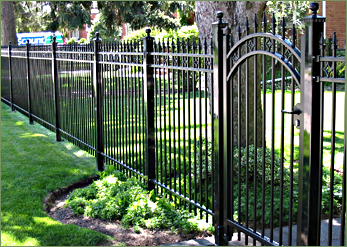 Wrought iron fences can be a work of art and are the choice of homeowners who want both security and beauty. They are more expensive and need to be repainted every two or three years. Some properties may do well with a "fence" that is a barrier made of hedges and shrubs. If you choose the right plants, they can add some privacy and will be sure to add plenty of beauty. Good choices are evergreens such as juniper or arborvitae. No matter which type of fencing you choose, be sure to properly maintain it. An attractive fence can add quite a bit of resale value to your home. The arrival of spring brings new ideas of projects and to-do lists around the house, such as cleaning gutters, landscaping, and pressure washing. Many of these maintenance projects have environmentally-friendly alternatives. Here are a few ideas to get the ball rolling on thinking up environmentally-friendly ways to maintain your house. The first thing we should address when discussing environmentally-friendly homes is energy efficiency. You are probably already doing some things to cut down on your energy impact, such as using Light Emitting Diodes (LEDs) and Compact Fluorescent Lights (CFLs). These lights are easy to find in stores, use less energy, and have a longer life cycle than traditional bulbs. With summer around the corner, the air conditioners are going to be running full blast again (if they aren't already). Another way to maintain an energy efficiaent home, and also a good project to do in spring, is to check your insulation. The correct amount of insulation will allow the house to maintain consistent temperatures easily. Not only will this cut down your electricity bill, but it will cut down on the amount of energy your house is using to run the AC. All homeowners at one point or another have to break down and call a pest control service. Unlike pest control companies that use pesticides and poisons, there are several green pest control companies nationwide and locally who are certified by the Green Shield program, which is the first national program to hold stringent prevention-based standards and regulations. For small infestations or basic prevention, DIY solutions will work just as well and cheaper than a pest control service. Diatomaceous earth and boric acid will deter cockroaches and kill ant beds. Regularly cleaning and maintaining your home and yard will keep down the pests as well. Chlorine and other chemicals have long been used to keep pools clean, but many pool owners are finding alternative ways to reduce chemical usage. Salt water systems have become very popular in lieu of chlorine systems. Also, robotic pool cleaners can clean up any debris that falls in. If you don’t have time to personally clean up your pool, there may be local green pool cleaning services that can give your pool a deep clean. With spring arriving and summer around the corner, there are a lot of house projects already on the to-do list. Finding green ways of doing them will greatly reduce your impact on the environment. Hopefully, these ideas will get you started! Featured image courtesy of Arete Pest Control. Many people consider spring to be the best time of year. Living in Florida we don't get the coldest winter, but it is still nice when the weather begins to turn and it is still cool enough that we aren't dealing with the overwhelming heat that comes with summer. There is new growth and warmth, but these things can bring a host of problems for your home if you aren’t properly prepared. Making these repairs now also means that you will be prepared when the next hurricane season rolls around. Here are a few things you should look into before spring or as it starts to get warmer. For homes that experience snow and ice, the severity of the winter can affect your roofs condition, but even for homes in Florida the spring is a great time to check your roof for any damages before the the next hurricane season. There is no way to know if there is damages without inspecting it. Any loose shingles need to be replaced, and cracks need to be sealed. Just because you don’t have winter storms doesn’t mean you shouldn’t worry about leaks. The spring and summer will bring plenty of rain and you want to be sure you are prepared before potential water damage becomes an issue. You should hire a professional to inspect and repair your roof since they have the tools needed to find the little things that haven’t become problems yet. This is also a good time to clean your shingles and remove any moss or stains left from algae. The winter may have brought relief from pests, but they are about to make a comeback. The best way to avoid this? Get on your pest control ahead of time. This is particularly important if you live in a warm and humid climate because this is where pests thrive. Get your home inspected to make sure you don’t already have a problem and that you are taking the proper precautions. You may begin using your air conditioner once the temperatures rise, so you want to make sure that you aren’t spending a ton of money trying to cool the outside. Check your insulation, especially in areas like the attic, to make sure you aren’t letting all the cool air escape out of your house. If you haven't already done one, this is also a good time to get an energy audit from you power provider. The audit may also offer some discounts for home upgrades like new insulation or windows. Check with you local power company to see what they offer. While not a complete necessity, if you don’t have a lot of space in your garage, but you do have some extra yard space, adding a shed can be a great investment. This will allow you to free up some space in your home and garage by storing any tools and equipment in the shed. This will make your tools more accessible and prevent frustration from overcrowding. You can build a simple shed from a kit or from scratch if you are handy with tools. Just as your roof may take a beating during the winter, you should inspect your siding to confirm it is still in good condition. If it is damaged or broken, you need to repair it quickly. The siding can often suffer from damage due to heavy winds, rain, and snow during the winter months, making it necessary to replace the materials if they've worn down. Not only does your siding keep your house looking good, but it also protects the house from damage, so don’t neglect this. It's important to take good care of your home so you can enjoy it for many years. By performing a few updates before the spring season, you can get more use out of the space and ensure that you don’t have any massive problems that you could have prevented. At J&M Home Management, we are happy to facilitate any and all of these projects for our clients. If you are interested in setting up a FREE walk though of your home to discuss our home watch services, please contact us at 727-368-6589. Beginning with the most obvious, it is just a good idea to keep your most valued possessions safe -- and your home should indeed be counted among these, as it is likely the most significant investment you've ever made. That beautiful necklace your husband bought for your anniversary is something you treasure. A security system will help keep it safe. The big-screen TV, the priceless flatware, and the confidence that comes from being secure are essential reasons to have a security system. Home security systems can prevent burglars and other criminals from achieving their ends, which translates into a lower crime rate for the neighborhood at large. This lower crime rate, in turn, makes the area seem more desirable for potential buyers, thereby increasing the value of your home. Plus, you want your children to be able to play in the yard or at the park in safety. It is about protecting your family as they are what is most important. That security system can provide that sense of security that you are seeking. Indeed, it costs money to install a security system. But most insurance companies provide lower premiums when a home has additional security, as this means the homeowners are less likely to make a claim. The reason they are less likely to make a claim is the risk that lead to claims is reduced with a security system. The security system protects you from burglars and potential vandalism or violence. It also can warn you of any flooding issues or a possible fire with that smoke detector. Essential security devices such as smoke and carbon monoxide detectors are required in any home on the market. But other systems can alert residents to issues that aren't supported by primary insurance, such as water damage. While flood insurance is rarely required unless the home is located in a hazardous zone, flood sensors are for more than just flood detection. If the line breaks on your fridge water dispenser, the sensors will let you know before the water reaches a destructive level. A surveillance camera allows you to not only keep an eye on what the kids are up to but also keep tabs on the babysitters. While young ones are likely to complain about an invasion of privacy, parents can rest easy knowing that their offspring are far less likely to engage in dangerous or reckless behavior if they know they're being monitored. These are compelling reasons to protect your home, but they're only the beginning. Keep your most significant investment safe with the minimal additional cost of a home security system. Don't stop at a security system when protecting your home. In addition to having a security system in your home, we highly recomend having a Home Watch company that can respond to emergencies when the alarm is triggered. Of course, first responders should always be the first people to report to an emergency and make sure the area is safe and secure, but if you are away and a break-in is discovered, they police will expect you to have the ability to secure the broken window, or whatever other actions are required. Short of getting on a plane yourself, having a Home Watch Professional on retainer will allow the issue to be addressed and corrected quickly. Keep in mind, first responders only respond to emergencies and a burst pipe in your home may not qualify as an emergency in their book. Having a Home Watch professional on your side also means helping to mitigate any additional damage that can occur from a minor water leak that can turn into a major repair very quickly. Don't wait, contact us for your Home Watch needs today!